Overview - It is ten years after an aging Batman has retired, and Gotham City has sunk deeper into decadence and lawlessness. Now, when his city needs him most, the Dark Knight returns in a blaze of glory. Joined by Carrie Kelly, a teenage female Robin, Batman takes to the streets to end the threat of the mutant gangs that have overrun the city. And after facing off against his two greatest enemies, the Joker and Two-Face, for the final time, Batman finds himself in mortal combat with his former ally, Superman, in a battle that only one of them will survive. A dark, gritty rendition of the Batman mythos, Frank Miller's 1986 classic, 'The Dark Knight Returns,' remains one of the most important stories ever told in the superhero medium. Along with Alan Moore's seminal 'Watchmen,' the series helped define the modern era of comic book storytelling, paving the way for more complex, literary interpretations of classic spandex-clad heroes. Though it's been a major influence on Christopher Nolan's 'Dark Knight' film series, a true adaptation of the comic has remained elusive. That is, until now. Produced by Batman mainstay Bruce Timm, this animated adaptation attempts to do the groundbreaking series justice. Faced with a rather daunting task, the filmmakers have done a solid job, and while there are a few issues here and there, this is a mostly successful translation of Miller's celebrated work. Set in a dystopian Gotham City, the story follows an aging Bruce Wayne (Peter Weller) who decides to come out of a ten year long retirement as Batman. With a vicious street gang called "The Mutants" terrorizing the city, Wayne once again dons the cape and cowl to fight injustice. Meanwhile, Harvey Dent (Wade Williams) is released from imprisonment, complete with plastic surgery that's healed his hideous scars. Unfortunately, the same can't be said about his fragile psyche, and Two Face soon returns to a life of crime. Joined by a plucky young female Robin named Carrie Kelley (Ariel Winter), Batman attempts to handle Two Face and the Mutants, but the Dark Knight isn't a young man anymore and his body might not be up to the task. As he is beaten and battered, Wayne struggles to find the strength needed to vanquish his foes before it's too late. Staying rather close to the source material, the filmmakers present a mostly faithful adaptation of Miller's challenging comic. Elements have been simplified, and there are a few bits of new material, but all of the major beats are here, and several scenes are taken straight from the book. The film even features many of the extended news reports that litter the comic, providing a larger overview of Gotham and Batman's place within the mindset of the city. The most notable absence from the book, however, involves the exclusion of Batman's inner monologue. This makes sense, as a voice over heavy presentation would likely have been overbearing, but I can't help but miss Batman's noir influenced observations and personal insights. For those unfamiliar with the comic, the film's portrayal of Batman might seem like a pretty jarring departure from many classic interpretations. While a dark and brooding take on the character and his rogues gallery has become a staple of the Batman mythology, Miller's work really takes it to the absolute extreme. An unrelentingly dark, exaggerated, Clint Eastwood-esque figure, Miller's Batman is a hulking, weathered beast of a man. Calculated, physically intimidating, and quite psychotic, this is a much more violent and brutal take on the Caped Crusader. Likewise, the story examines the twisted psychology of the character, elaborating on Wayne's almost primal need to be Batman. He seems to relish every punch and kick, whether he's doling them out or receiving them. Keeping in line with the respectful treatment of the story, the animation also provides a pretty decent approximation of Miller's distinct style. The characters have certainly been streamlined, and the overall presentation lacks the gritty texture of the source material, but the designs still manage to evoke Miller's intentions fairly well. It's not quite a direct translation, but at times it's pretty close. Action scenes are well staged and carry a moody sense of atmosphere, and while the flick can be very brutal, the violence has been toned down from the book. Robocop himself, Peter Weller, handles vocal duties for Bruce Wayne/Batman, and while this paring sounds great on paper, in practice it's a bit of a mixed bag. Weller's monotone delivery can feel flat at times, but the actor still manages to bring a solid level of grizzled intensity and restrained psychosis to the role (though I still think they should have gone with Michael Ironside who did a great rendition of Miller's Batman on an episode of the 90s animated series). Unfortunately, several other characters are prone to occasionally stilted delivery as well, but the majority of the cast is decent overall (Ariel Winter's spirited Robin being the real standout). While mostly effective, the film does have some issues. The animation is good, but there are times when the style can be a little too simple, with rather bland and mundane backdrops. Despite my admiration for the source material, I actually think that the book is a bit overrated, and many of its flaws find their way onto the screen as well. Beyond the novelty of Miller's dark take on the Batman mythology (which isn't so novel anymore), characterizations are actually very thin. Batman's internal monologue helped to flesh out his motivations in the book, but as I mentioned earlier, those insights are lost here, and it really hurts the presentation. I remember being really drawn in by Miller's dark prose, and that sense of character found in the comic's captions is mostly absent. Likewise, the plot is basic and while it leads to some cool action, there really isn't a whole lot of depth beneath the narrative (if the comic is any indication, the second part should be more robust in this regard). Though understandable, Warner's decision to split the comic into two films also doesn't help matters much, as the story feels incomplete and a little too short. Also, the Mutants' ridiculous futuristic lingo is just as annoying as it was in the book. Actually, it's even more annoying. A truly defining work of superhero storytelling, Frank Miller's 'Batman: The Dark Knight Returns - Part 1' is given a very solid adaptation. The story is largely intact, the animation evokes Miller's style well, and there is an effectively moody sense of doom that permeates throughout the runtime. With that said, the voice acting is a mixed bag, the inherent flaws of the source material remain, and the missing narration places us at a distance from the protagonist. It's not a perfect translation, but Batman fans should be pleased, and admirers of Nolan's version of the character should definitely check this out. 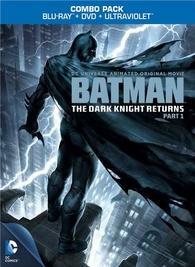 Warner Brothers presents 'Batman: The Dark Knight Returns - Part 1' in a Blu-ray/DVD/Digital Copy Combo Pack. A BD-25 disc is housed in a keepcase with a cardboard slipcover. An additional DVD copy and an insert with instructions for a downloadable UltraViolet digital copy are also included. After some skippable trailers, the disc transitions to a standard menu. The movie is provided with a 1080p/AVC MPEG-4 transfer in the 1.78:1 aspect ratio. Taking inspiration from Frank Miller's original artwork, the animation can be impressive, providing some interesting visuals that do a nice job of bringing the iconic panels to life. The digital source is clear, clean and free of any obtrusive noise. The stylized animation is sharp, but the streamlined aesthetic doesn't really offer much detail in the traditional sense. Colors are richly saturated and pop nicely, but the palette can be on the dull side (which stays true to the original graphic novel). With that said, certain scenes are bathed in some striking hues, vaguely evoking Lynn Varley's moody watercoloring work from the source material. Contrast is high with deep blacks and a nice sense of dimension. The only major drawbacks to the image involve some faint horizontal banding in backgrounds (most notably the sky), and some minor aliasing around edges. These artifacts can be noticeable, but they're relatively negligible. Featuring a solid approximation of Frank Miller's distinct style, 'The Dark Knight Returns - Part 1' comes to Blu-ray with a very nice transfer. The animation is well done and outside of some periodic banding issues, this is a very pleasing video presentation. The film is provided with an English DTS-HD MA 5.1 track, a French Dolby Digital 5.1 track, and a Spanish Dolby Digital 2.0 track. English SDH, Spanish, and French subtitles are also available. With nice effects work and a powerful musical score, the film sounds quite good. The movie starts off with a bang, and the initial sequence (which features Wayne in a car race) is the film's most impressive audio set piece. With that said, dialogue can get overpowered by effects work. Thankfully, this isn't an issue throughout the rest of the film and speech remains clear and distinct. As a whole, the mix is spacious and fairly immersive with nice directionality and smooth imaging. One scene involves Batman pulling a criminal into a cloud of smoke, and the manner in which the criminal's cries for help slowly transition to the rears is truly eerie and enveloping. Various gunshots, explosions, and punches come through with nice fidelity, but don't quite carry the kick that live action releases do. On the other hand, The Dark Knight's tank-like batmobile does create an appropriately room shaking rumble. Special note should also go to the film's gloomy score which creates a palpable sense of doom throughout the runtime. With a bevy of aggressive action scenes, the film is lively and immersive. Effects work isn't as weighty as live action efforts, but the sound design is well executed and is free of any technical issues. Warner Bros. has provided a nice assortment of extras (many Blu-ray exclusive), including a featurette on Batman creator Bob Kane, and two episodes of the Emmy award winning 'Batman: The Animated Series.' All of the supplements are provided with Dolby Digital 2.0 audio and the same subtitle options as the main feature. Sneak Peek at Batman: The Dark Knight Returns - Part 2 (HD, 7 min) - Presented in 1080p, this is a sneak peek at the film's upcoming sequel. Interviews with the cast and filmmakers are provided as storyboards, animatics, and comic book panels are shown. Unfortunately, no completed animation is available, but we do get to hear some scenes and see the performers in action in the recording booth. If the comic is any indication, the second installment should be really cool. Sneak Peek at Superman/Batman: Public Enemies (SD, 8 min) - This is a behind-the-scene look at Superman/Batman: Public Enemies. More interviews, comic panels, and animatics are provided along with some completed animation. The best part of this featurette is getting to see Kevin Conroy, Tim Daly, and Clancy Brown recording their lines together. 'Batman: The Dark Knight Returns - Part 1' is a mostly successful animated adaptation of Frank Miller's celebrated comic book series. A dark, violent interpretation of the Caped Crusader, the film features cool animation but suffers from some thin characterizations and occasionally stilted performances. The video transfer and audio mix are both very good, and the supplements offer a few solid bonuses for fans. It's not a perfect translation, and some of the book's inherent flaws are still present, but fans of gritty superhero stories should definitely check this out.